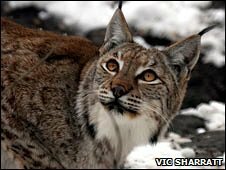 An Oxford conservationist believes the Eurasian lynx which is extinct in the UK could be reintroduced. In his State of Britain's Mammals report, Professor David Macdonald said the reinstatement of the previously native lynx was a "high profile" issue. Of the UK's large extinct carnivores - the lynx, bear and wolf - he said the lynx would be the easiest for humans to live alongside. The report shows it could also help control the expanding deer population. Until recently, the "big cat" was thought to have died out 4000 years ago, but new research shows it survived into medieval times and died out as a result of persecution by humans. Professor Macdonald's report, co-written by his Wildlife Conservation Research Unit colleague, Dr Dawn Burnham, states: "The recently identified human involvement in its demise strengthens the case for reintroducing lynx in Britain. "Lynx would most likely hunt roe, sika and juvenile red deer, supplementing their diet with hares and foxes." The report highlights the growing population of "free-ranging" deer species in Britain as a major cause of damage to protected woodland. It accepts the lynx would attack sheep, but that this problem could "probably be small scale and localised" and would be manageable. It suggests there is enough forest in Scotland and northern England to support a viable population of around 450 lynx, should a reintroduction programme go ahead. The report was commissioned by the People's Trust for Endangered Species charity. The charity is already part-funding a trial project to reintroduce Eurasian beavers to Scotland in spring 2009. The beaver was hunted to extinction in the UK in the 16th Century. Many other conservation issues are discussed in the State of Britain's Mammals report, including the "catastrophic" decline of the water vole. Professor Macdonald said climate change had "rocketed" up the agenda but that: "The greatest ultimate driver of the extinction crisis and general environmental degradation remains human population growth and consumption."